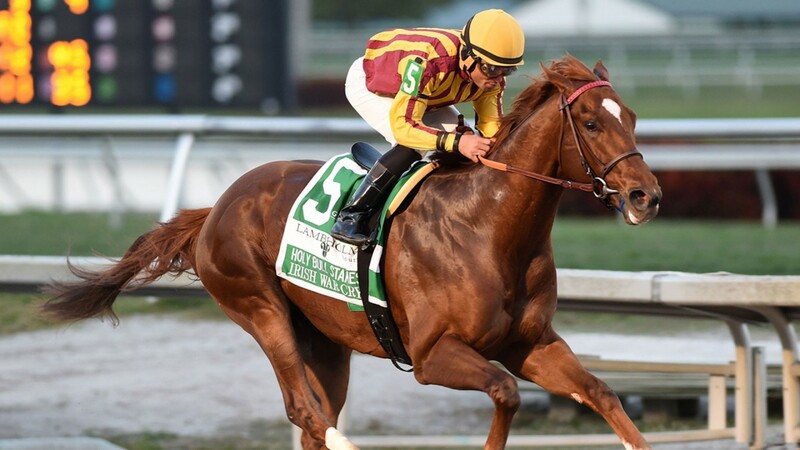 Irish War Cry, a dual Grade 2 winner and among the leading fancies for the Kentucky Derby on Saturday, will stand alongside his sire Curlin at Hill 'n' Dale Farm in Kentucky after his retirement from racing. The colt, trained by Graham Motion for his breeder Isabelle De Tomaso, took the scalps of Gunnevera and Classic Empire to land the Holy Bull Stakes in February and notched another Grade 2 victory in the Wood Memorial Stakes last month. Breeding rights in Irish War Cry have been bought by a group including Hill 'n' Dale supremo John Sikura, SF Bloodstock, China Horse Club, Craig Bernick of Glen Hill Farm, Colts Neck Stables, Bobby Flay, Sol Kumin and Vincent Viola. He will continue to carry De Tomaso's silks on the track. Sikura told Daily Racing Form: “Buying into a very good son of an elite sire appeals to everybody. Irish War Cry is bidding to become the first winner of the Run for the Roses bred in New Jersey since Cavalcade in 1934. He is out of the winning Polish Numbers mare Irish Sovereign and is a half-brother to winners Irish Defence, Irish Politics, Irish Score, Irish Strait and Irish Windsong. His sire Curlin heads the Hill 'n' Dale roster at a fee of $150,000 after supplying Classic heroes Exaggerator and Palace Malice and brilliant fillies Curalina and Stellar Wind.